We now know that eleven ticks species can be found in New Jersey, thanks to Jim Occi, Andrea Egizi, Richard Robbins, and Dina Fonseca. Surprisingly, not many states have a full accounting of the tick species within their borders. 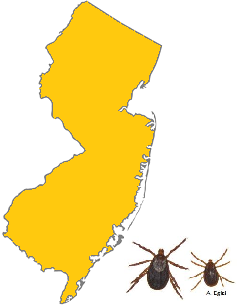 But after the discovery of the invasive Asian longhorned tick (Haemaphysalis longicordis), it seemed like a good time to correct that for the state of New Jersey. If surveillance or control measures are ever considered, then you need to know who is present. All species are supported by voucher specimens. This list is, of course, subject to revision upon further discoveries. See the original article Annotated list of hard ticks (Acari: Ixodida: Ixodidae) of New Jersey by J L Occi, AM Egizi, RG Robbins and DM Fonseca in Journal of Medical Entomology 2019, 1-10. This entry was posted in Uncategorized and tagged hard ticks, tick list on March 19, 2019 by Lisa Reed.